The hero, a woman stabs her husband dead, drowns the daughter. Quietly, no emotions. Goes to bed only to wake in the morning and discover that their cat is missing - that’s where our movie starts… A short film about alienation, loneliness, loosing yourself. Born 1983 in Poznan, Poland. Graduated in Film Production at the Lodz Film School, Olga started as a Director’s assistant and 1st AD on numerous feature films and TV series (Oscar nominated “In darkness” by Agnieszka Holland). She directed for theatre (Edward Albee’s “The goat or who is Sylvia”, Tuvia Tenenbom’s “The Last Jew in Europe” etc. ), award winning television series (“The Deep End”) and recently short films “3xLOVE” won Grand Prix at “Distances” Short Film Festival in Dublin and “Morning has broken” (opened in Raindance). Her feature debut film “Nina” opened in International Film Festival Rotterdam winning BIG SCREEN AWARD. 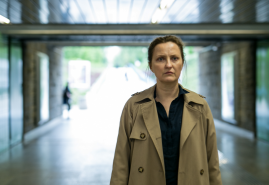 Currently she’s on of four women to direct first Polish Netflix original series “1983”.